What San Diego Is Like - Why Go - Will You Like It? We know how hard it can be to start planning San Diego vacations if you don't know much about it. Instead of using mood-altering substances to get you through your vacation planning, try our easy, 10 steps (or less) to plan San Diego vacations. We've arranged the steps in the order which fits our style of planning vacations, but you can go through this guide in any order that suits you. If the b-b-budget is a priority, start by learning to say the M-word (money) without fear. If your San Diego vacations include an annual event, start by finding out when it happens. If you want to just show up and figure out the rest of your vacation after you arrive, we applaud your sense of adventure, but don't count on your good luck to get a San Diego hotel room at the last minute. Start with Where to Stay. 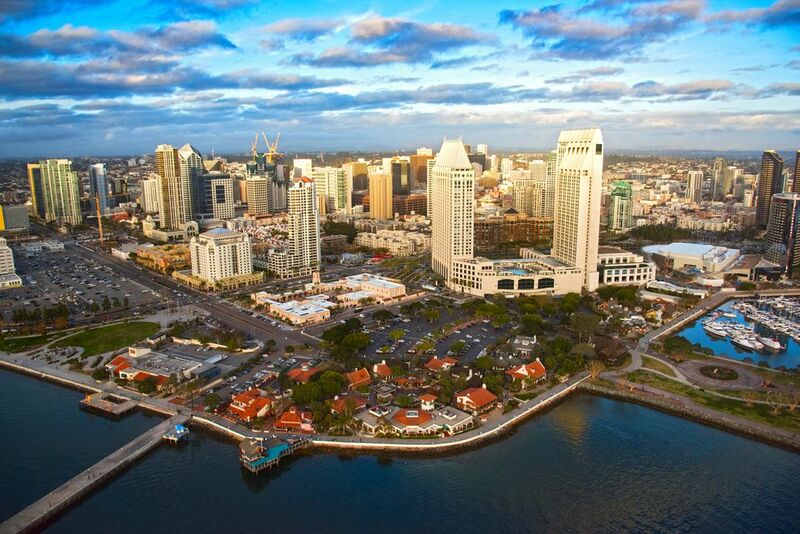 In a historical sense, San Diego is California's oldest city, but in another way, it's also the most modern, growing in the late twentieth century to become California's second-biggest city and one of the largest in the United States. San Diego is spread-out metropolis that sprawls over much of San Diego County, with a population of over 1.2 million in 2006. With all that space, its population density is only one-third of San Francisco's and unless you're visiting friends or family, you're likely to see only a small portion of its 300 square miles. Most of the popular tourist sights are concentrated around downtown and the waterfront, with Old Town and Sea World a few miles north and the San Diego Zoo Safari Park further away. Take a look at the San Diego Picture Gallery, where you'll find scores of San Diego photographs and plenty of photo tours for ideas and inspiration. Learn a little more. Check out the Facts About San Diego, from the world-famous zoo to the largest wooden structure in the United States. San Diego has California's best weather year-round, with lots of nice beaches and places for outdoor recreation. Oddly for such a fast-growing city, San Diego seldom gets a new tourist attraction, so you probably already know the list of top sights, which is heavy on animal-focused attractions. Perhaps less well-known is that our readers say La Jolla village and Coronado Island are among their favorite things to do in San Diego. Will You Like San Diego? If you like nice weather, beaches, outdoor recreation and animals, San Diego may be the place for you. No matter where they're located, local visitor's bureaus will claim their city has it all, but even a city as popular a San Diego isn't for everyone. Visitors who object to animals in captivity will find their list of places to go cut almost in half. If you're looking for top art museums and performing arts, your options are somewhat limited in San Diego and if you're looking for theme parks with big roller coasters, head further north to Anaheim and Los Angeles. Although San Francisco is famous for its fog, San Diego isn't that far behind. In May and June, as much as one-third of the month can be overcast, cloudy or foggy as the ocean's marine layer gets stuck over the land. According to the San Diego Visitor's Bureau, people stay just four nights on the average and you may have even less time than that, so some prioritizing is essential. These are the highlights, but before you start planning, you need to know that it takes a full day to visit the San Diego Zoo, Sea World, San Diego Zoo Safari Park or Legoland. If you have just one day, take a harbor cruise. Before it or afterward, take a drive over the bridge to Coronado or putter along the coast up to La Jolla. Both are fun places to visit and they have great beaches, too. If you have a weekend, you can slow down a bit. Plan a weekend getaway and you'll have time to visit one of the attractions that take a full day. If you have 3 to 4 days, add Balboa Park and visit Old Town, another all-day sight or a side trip. You'll find plenty of ideas for them in the Day Trips Around San Diego section of this guide. If you have 5 to 6 days, take a day off. These destination hotels are a good place to do it, or spend the whole day relaxing at Mission Bay. The map above shows the main tourist areas in San Diego, but if you want to know where individual attractions are or get driving directions, use the interactive version. I don't intend to sound like a geography teacher, but learning where things are in San Diego can help you with the rest of your planning, especially when deciding where to stay. The map above can help you get an idea of the San Diego area, especially how far things are from downtown. You'll find a more detailed one showing all the popular attractions on the Famous Spots page of this planner. Learning more about San Diego's layout can help you choose the best place to stay, picking a hotel that's close to the things you want to see most. San Diego is a sprawling city, but most of its attractions are in just a few areas, centered on downtown. Downtown/Gaslamp Quarter: Most convenient for convention-goers, close to Seaport Village, the USS Midway, PETCO Park, Maritime Museum and the take-off point for harbor cruises. Hotel rates are driven up by convention visitors and most charge for parking. Balboa Park: The San Diego Zoo is its most popular attraction, but not the only one. In fact, there's so much to do here that you're sure to find something, no matter what your interests are. Coronado: Across the big bridge from downtown, home of the historic Hotel Del Coronado and one of the city's best beaches, it also has a charming downtown area good for a stroll, shopping or a meal. Old Town: Historic buildings, shops, a cadre of always-popular Mexican restaurants and the haunted Whaley House. Mission Bay: Sea World is here, but it's also a lively city park with lots of places to play. La Jolla: An upscale place that doesn't feel intimidating, great for shopping (even if it's only the through-the-window kind), beach play and home to some great restaurants. Save Money: A Dozen Savvy Ways: Smart travelers can reduce costs, and they don't sacrifice quality to do it. Get 12 ideas to keep ways to keep the cost of your San Diego trip under control. Things to Do for Free in San Diego: In our opinion, there's no better price than free. Get the Best Hotel Rates in San Diego: You could just go right to our list of cheap San Diego hotels, but if you use these tips instead, you can stay in a four-star hotel for the price of budget chain. San Diego's top things to do include its beaches, the San Diego Zoo, Sea World, the USS Midway, Balboa Park, Legoland, the San Diego Zoo Safari Park, La Jolla and Coronado. You can see where they all are on the map of San Diego attractions above. Use the guide to San Diego's top things to do to learn more about them. Maybe you've visited all the top sights and attractions, perhaps your tastes are different than the "typical" tourist, or maybe you'd just like to see more of San Diego. Try a few of these 9 Things You Didn't Know You Wanted to Do in San Diego. If you'd rather, you can use a larger, interactive version of the map to explore the city and get driving directions. Besides seeing the sights, many San Diego visitors enjoy a harbor cruise. It's a good way to rest your tired feet and see the city from a different angle. Things to Do for Free in San Diego: Free tours, free museum admissions and free performances can help keep you busy while keeping your wallet full. Things to Do on a Rainy Day in San Diego: A rainy day doesn't have to be a vacation-buster with these fun tips. Things to Do With Kids in San Diego: A collection of great things to do with kids in a kid-friendly city. Tijuana: The world's most-visited border city is only a short drive from San Diego. Our guide includes special tips about crossing the border and how to bargain with the Tijuana shopkeepers, but read the cautions before you go. Julian: A charming gold-rush town, cradled in the mountains and surrounded by apple orchards. Especially nice in the fall, but a pleasant side trip any time. La Jolla: Surrounded by aquamarine waters and filled with art galleries, shops and some of the area's best restaurants, La Jolla, "the jewel" in Spanish adorns the shoreline just north of San Diego. In case you're looking for something a little different, try this list of day trips for more than 100 ideas. You'll find cute towns, tide pools full of sea creatures, a Presidential Library and behind-the-scenes tours, all within a day's drive of San Diego. If you'd rather have someone take you out for a San Diego day trip than do it yourself, Viator.com offers a wide range of day trips to Tijuana, Baja Wine Country, Rosarito Beach or Ensenada, Mexico along with one-day trips to Universal Studios or Disneyland. San Diego is on the California coast, just a few miles north of the California/Mexico border. It's 120 miles from downtown Los Angeles and 502 miles from San Francisco. It takes almost 5 hours to drive there from Las Vegas. People ask about some places so often that we've compiled special pages that detail all the ways to travel between San Diego and Las Vegas. San Diego Airport (SAN), sometimes called Lindbergh Field, is conveniently located near downtown, and most major airlines fly to it. Amtrak's Pacific Surfliner goes to San Diego from Los Angeles' Union Station. Most San Diego visitors, 60% of them, come in their personal cars. The most common approaches are I-5 from Los Angeles and northern California, I-15 from Las Vegas, and I-8 from Phoenix. Almost 30% of people who responded to our transportation poll said they rent a car to travel in California. You don't have to stay in a seedy motel with paper-thin walls to keep your San Diego lodging budget under control. Armed with price-busting tips that have landed us in four-star hotels for the price of a budget chain, you can find a great place to stay in a convenient location. If you've already decided what you want to see and do in San Diego: Deciding what area to stay in will be easy. Use the step-by-step guide to refine your choice. How to find a San Diego hotel deal - fast: We know you're busy, so choose the strategy that works best for you. If you just want to dive in: Go straight to the San Diego hotel guide, sorted by location and price. Bed and Breakfasts: Quaint and sometimes cozy, these bed and breakfasts and small hotels offer an alternative to the mainstream hotel. San Diego Camping: You'll find some great campgrounds, both within the city and in the nearby mountains. By now, you probably know that San Diego is spread out and some of the most popular attractions aren't close to downtown. Your best option in a city built around automobile transport is to rent a car and drive yourself around. Except in the busiest part of downtown, you can usually find a parking spot near your destination - and if you choose a hotel outside the downtown area, you won't have to pay for parking it while you sleep. If you're looking for other ways to get around, the San Diego Trolley is a good option - if it goes where you want to. You'll find other options in the San Diego Transportation Guide. Imagine having a California travel writer with over a decade of experience living next door. Let's have a chat and we'll share our best San Diego tips with you. Use them to plan a no-fuss, no-hassle trip to San Diego and your traveling companions will think you're a wizard of the highest order. 8 Ways to be a Smart San Diego Tourist: Less-savvy San Diego visitors spend money when they don't have to, eat bad food and stand in line too much, but you know better. Discover how to be a smarter San Diego tourist, enjoy your trip more and spend less of your hard-earned money doing it. Buy Your Tickets Ahead of Time: Not only can you stay out of lines at the ticket booth, but you're likely to save some bucks at the same time if you take a few minutes to figure out what you need tickets for and look into multi-attraction passes. Bring warmer clothing for evening, especially if you're spending time near the water. Ignore this advice and you're likely to contribute to the local economy when you have to buy something warm, quick. California attire is generally casual. You won't need your suit and tie (or cocktail dress and high heels) unless you're planning a very special activity or want to get into one of the Gaslamp's swankier clubs on a weekend night. If your vacation is in winter, bring an umbrella and light rain coat or jacket. If you don't have room for them in your suitcase, wait until the first drop of rain falls: the shops in all the tourist areas will sprout umbrellas faster than you can say: "I'm getting wet." Find out about average temperatures, San Diego weather and get more tips on packing by season. If you have a smartphone, look into apps that help with public transit. Yelp, Open Table and Zagat are good for finding restaurants people like anywhere you are. Is the GO San Diego Card Worth the Price? Do San Diego Discount Cards Save Money?